You're here because music is important to you. You understand the power and energy that music brings to the party. You don’t want a corny DJ who tells dad jokes and plays the Chicken Dance. You want a professional DJ who can read the room and has the talent to fill the dance floor. An eclectic mix of top 40, 80’s motown, 90’s hip-hop, a sprinkle of early 2000’s pop, EDM, oldies, and everything in between. From classics to contemporary, I pack the dance floor! I live to party! I love music and I love people, blending those together is what I do for a living. From start to finish, I like being organized and prepared so all I have to do is focus on the party! Growing up in Oakland during the hyphy movement, Luke started DJing on vinyl as a hip-hop DJ. He speaks fondly of the days of digging for E-40 and Nelly vinyl at Amoeba Records in Berkeley and the local radio station 106 KMEL. His first paid gig was a family friend’s wedding, and the fact he had both the young people on the dance floor and the old folks rockin’ in their wheelchairs is how he got his business started.Luke moved to New Orleans to study music in college and held DJ residences at venues such as “the #1 college bar in the nation (USA Today),” The Boot. In addition to spinning the hottest nightlife spots in “the big easy,” Luke has also opened for artists including Bruno Mars, G-Eazy, Young Money, Wu-Tang, Miguel and toured the United States playing at festivals like New York Wine and Food Festival and SXSW.But not only is he a veteran club festival DJ, Luke’s versatility shows in spades as he rocks weddings has a corporate client list that includes Microsoft, Miller-Coors, Red Bull, Sony, the Recording Academy. Today, Luke continues his 10+ years of spinning in New York City. His sets are spontaneous, interactive and ready to adapt to the energy of any crowd. Whether Luke is playing for a private wedding or exclusive party, he’s ready for you to feel the groove like you have never before. Simon, Chief Remixologist, will be back to you shortly about my availability and pricing. Thank you! I’m known for hip-hop and house music, but he mixes so much more! With the lights down low and the music turned up, you come together for your first dance. Friends and family gaze, adoring your elegance, beauty, and undeniable love. As your first dance comes to an end, DJ CoolHand mixes in "Wanna Dance With Somebody" and everyone joins the party! Want to hear what more of what I have to offer? When it comes to live audio, reliability, clarity, and quality are key. Included is top tier gear, so you can forget about technical issues. No laptop. Like other top DJs, I mix on the same gear used by the best professional DJs around the world. By using Pioneer CDJ's instead of a controller, my setup is more reliable and technically sounds better than any laptop-based mixing gear. 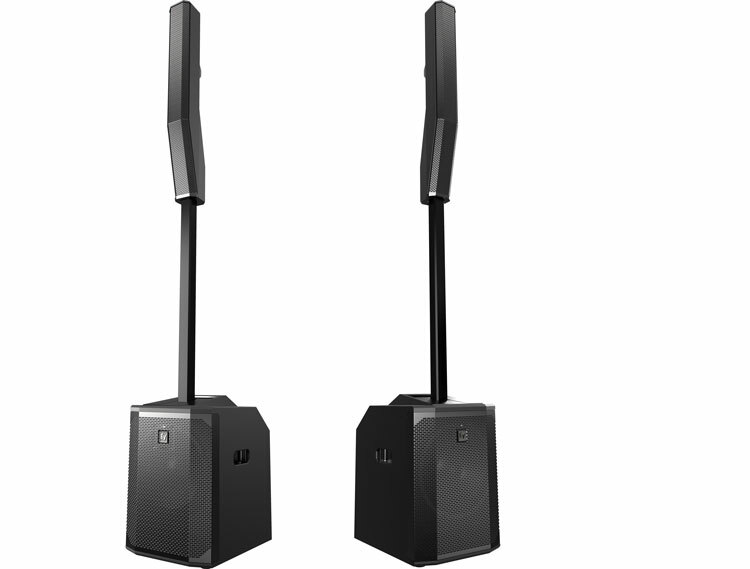 The new, sleek Electro-Voice column array speakers are the new standard for live performance audio. The Evolve 50's have a clear separation of frequencies to create a powerful deep bass and clear treble. QSCs carry the energy of the music and ensures a good, clean sound. Plus, they are loud enough for small to medium size rooms. The Shure ULX-D is the state-of-the-art industry standard, the natural choice wireless mic for touring artists such as Beyonce and Bruno Mars. All the best equipment in the world won’t fix bad sounding music files. I get my music directly from DJ record pools and official sources, so that your party has the best sound. Guaranteed. How did you hear about DJ CoolHand? My pricing starts at $2,000. Get in touch for your custom quote. Yes, I carry the standard liability insurance policy that is required by all venues and will email this to your venue or planner before your event. do you mC or speak on the microphone? Yes, and all MCing is professional, tasteful, and kept to a minimum as specified by you. Do you bring lights, fog, tv monitors, etc? My focus is the music. I bring the best sound system. If you are interested in more than just basic uplighting, I will help you coordinate with a lighting vendor. All my bookings are through Remixologists, but when you book me, I am the same person planning and DJing the day of the event. No stand-ins or people in the way of our party! how do you handle music requests before and during my event? There's no DJ ego from me, I take requests. Honestly, requests can sometimes be off-base, but, more often than not, they give me insight into how some guests feel. I will do my best to satisfy every request while maintaining the best environment. My music is mixed live, so the BPM/key/genre might fit later on or already be the next song cued up. Before your event, I accept spreadsheets, Spotify playlists, or whatever format is convenient for you. You can be as general by listing only vibes or genres or as specific as you want. There is no limit in how many songs you can request. I pride myself on reading a crowd, but even if you have a set list, that is a creative endeavor in itself. Can we submit a Do Not Playlist? Sometimes the best place to start is writing out your "Do Not Playlist." A Do Not Playlist can be as firm as you'd like. Generally, it's easier to know what you don't want than to get into the specifics of what you do. Do you specialize in international or ethnic genres? I don't claim expertise in any one international genre; I've done Jewish, Spanish, Greek, Korean, Serbian, Liberian, Italian, Irish, Persian, Swedish, Russian, Chinese, German, Indian, and Bosnian events. I am not bilingual, but I can try to connect you to a bilingual MC or your friend might be interested. Do you meet with clients before booking? Most of the time, potential clients prefer just emails and chatting on the phone. We could also Facetime or Skype. I’m open to meeting at a coffee shop in Manhattan during the week (I’m working most weekends), if you’d like. What kind of events do you work for? Being an open format DJ, I can provide music for pretty much any type of event. I've spun at all kinds of clubs, weddings, and private events. Click here to get in touch about your event. I was raised in the 90's so I have a soft spot of golden-era hip-hop and pop music. I am an open format DJ, meaning that I listen to, play, and mix any style of music from oldies to house music. I am based in New York, but travel all over the world for events. I feel most comfortable in a suit, but I am open to wear what the event requires. Will you Advertise at my event with signs or banners? Nope. Your event is about you. I will not advertise over the microphone or with banners at your event. Do you play dirty or clean versions of songs? I default to playing clean music. I think it is best to remain family friendly, but if you have a request that I cannot find a clean version of, I will ask. All is top professional-quality DJ equipment. Click here to check out my equipment page. How long will you hold my date? I run a no-pressure operation. I want you to have the freedom to meet other DJs and choose me instead of being pressured by time or money. I only schedule meetings for dates that are available and I hold dates for a week after meeting or speaking by phone. There are no obligations for me or you before the contract is signed and retainer received. Once booked, the whole day is yours to allow for maximum time flexibility for the hours booked. how many events do you book per day? Just one. The date you book is your day so you get the customized, personal service you expect. When do you arrive to my event? I like to arrive a minimum of 1 hour before your event, but I try to be there up to 3 hours before. How do you motivate guests if no one is dancing? This is the difference between a good DJ and a bad DJ: judgement. Music is the best motivator, but I will invite people to the dancefloor, if necessary. I carry backup hard drives of music and equipment so there are no hiccups day of. If I am for some extreme reason not able to perform (hospitalization, etc. ), I have a network of DJs that are qualified to be an emergency replacement. Click here to contact Simon (Chief Remixologist) with your date, venue, and timeline. He respond within a 24 hours, usually within an hour of receiving your inquiry.